On Friday 10 March, 2017, Vytautas Magnus University and Kaunas City Municipality co-hosted the first event dedicated to the approaching Centennial of the Restoration of the State of Lithuania– the 2nd Forum of the Baltic and Black Seas, a discussion with the historical leaders, former heads of state from Central and Eastern Europe. The theme of the forum is “Europe Today. The Baltic Consensus (1987–1991): Historical Significance and Lessons for the Today’s World”. On the eve of 11 March, the Day of Restoration of Independence of Lithuania, the historical leaders, along with the academic community and other political, cultural and social figures, invited everyone to revive the historic memory, to look for new forms of dialogue, and to seek productive, good-neighbourly, responsible, and peace-promoting communication that is based on mutual trust and respect. According to the EU Ambassador in Russian Federation, Vygaudas Ušackas, the success story of the Baltic States is like a beacon for the countries of the Black Sea region in their way of continuous development towards democracy, free market and mature civil society. “Amid geopolitical tensions, confrontations and threats it is worth listening to the wisdom of historical leaders who played a significant role in the collapse of the Soviet Union and the reestablishment of statehood of their respective countries. Aiming to inspire faith in a dialogue and communication, Kaunas has summoned historical leaders in the name of security and prosperity, from the Baltic Sea to the Black Sea and far beyond”, the Ambassador underscored the importance of the event. 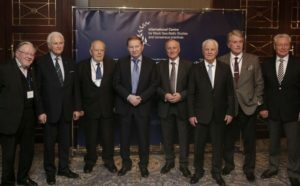 It is no coincidence that the former Presidents of Bulgaria, Estonia, Latvia, Poland, Lithuania, Moldova, Slovakia, and Ukraine joined the search for solutions in an academic venue. In the face of global challenges and regional threats of the 21st century, it is necessary to remember the national struggles for democracy and freedom and to engage in a closer dialogue with the academic community, especially the young generation. “It is both symbolic and meaningful that the forum will take place at Vytautas Magnus University: after being re-opened on the eve of the country’s independence by Lithuanian and diaspora scientists and intellectuals, this university became one of the first heralds of Lithuania’s freedom and a hub of humanist worldviews. Today, as we are standing once again at the doorstep of change, we call on everyone to turn to the ideals that led us towards democratization. In the name of peaceful solutions, we open the door for dialogue between the state and the citizens”, VMU Rector Prof. Juozas Augutis stated, highlighting the significance of universities in the considerations of the future. The anticipated participants of the Forum of the Baltic and Black Seas included former European heads of state who in the recent past dared to change the course of Europe, to steer it towards democracy and to strive for an active civil society in independent countries: Valdas Adamkus (Lithuania), Vytautas Landsbergis (Lithuania), Viktor Yushchenko (Ukraine), Bronisław Komorowski (Poland), Leonid Kravchuk (Ukraine), Leonid Kuchma (Ukraine), Petru Lucinschi (Moldova), Arnold Rüütel (Estonia), Petar Stoyanov (Bulgaria), Rudolf Schuster (Slovakia), Valdis Zatlers (Latvia), Gennady Burbulis (Russia). In the 1st Forum of the Baltic and Black Seas, which was organized in 2016, its participants signed the Kiev Manifest, which named the mission of united and purposeful peacekeeping as their goal. “Our common goal is to promote a system of values that is based on joint actions and ensures mutual understanding and support, along with a dialogue between generations and ideologies, the people and the state”, the manifest said. The region of the Baltic and Black seas, which has been shaped by the diversity of nationalities, faiths, and cultures, has a long and shared history. The former heads of state emphasize that it is only democracy, peace, and complete renouncement of war and aggression that can help the European community of nations to ensure security in the region. The event was organized by Vytautas Magnus University and Kaunas City Municipality. The forum was also supported by the project of the European Union “Public Diplomacy. EU and Russia”. During the conference, exhibition The Baltic Way by VMU professor, photographer Romualdas Požerskis was exhibited at the lobby of VMU Great Hall (28 S. Daukanto g., Kaunas). The exhibition captured the historical period when the leading positions in Europe were occupied by some of the conference participants. “Lithuania stands for the spirit of freedom kept alive by thousands and thousands of people – a spirit that survived Siberian frosts, betrayals by Soviet secret service collaborators, and the horrors of the gulag. Romualdas Požerskis managed to capture this ultimate aspiration in his photo exhibition and photo album “Lithuania in 1988-1993″. For many years Lithuania had been suppressed by a brutal force which crossed our border in 1940 through deception and blackmail with unconcealed intent to stay forever. Lithuania resisted the foreign army: the partisants, dissidents, the entire nation had never lost hope to regain freedom and independence”, President of the Republic of Lithuania Dalia Grybauskaitė is quoted in the introduction of the exhibition.